Recent cases have explored various aspects of the Tax Office’s ability to access material lodged as part of family law cases. The recent family law case of Kern  FCCA 1108 provides an example of where the interest of a State based revenue office can be enlivened. If you would like a copy of the decision please email me. A couple who had a 9-year marriage were engaged in proceedings in relation to the division of matrimonial assets. One of the assets related to some land that was gifted to the wife by her parents. Stamp duty was paid on the transfer at a value of $110,000. Evidence given by the wife to the family court was that the true market value of the land at the date it was gifted to by her parents was in the region of $150,000 and indeed, may have been closer to $200,000, particularly given that the final sale price for the land when it was subsequently disposed was $325,000. While the family court accepted the wife’s arguments that she should receive a disproportionate share of the proceeds of the sale of the land due to the contribution that she made, it was also decided to refer the evidence to the Stamps Office for further investigation. The family court has the inherent power to make a referral in situations such as this (i.e. effectively fraud) under the Evidence Act 1995. (a) The wife provided the incriminating evidence of her own free will. (b) The evidence provided was done so before a request for immunity was made. Following the successful launch earlier this year of the View Legal Directors Duties, Estate Planning and business succession apps, we have now developed and launched a further Apple and Android app. BDBNs can be an essential tool for anyone with superannuation savings. BDBNs are however heavily regulated and there are many aspects that can cause irreversible damage if misunderstood. 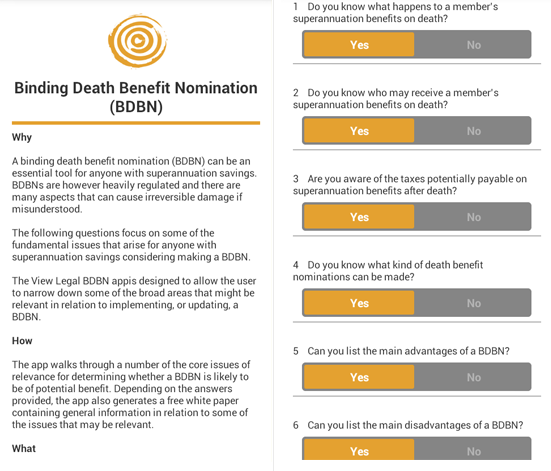 The app explores some of the fundamental issues that arise for anyone with superannuation savings considering making a BDBN. For those that do not otherwise have access to the Weekly Tax Bulletin, the most recently published article by fellow View Legal Director Patrick Ellwood and I is extracted below. Often a key reason for seeking to extend the vesting day of a trust will be to defer the likely tax and stamp duty implications that would arise where the trust vests and assets are distributed to the beneficiaries. The recent Queensland case of Re Arthur Brady Family Trust; Re Trekmore Trading Trust  QSC 244 (see 2014 WTB 42 ), provides a useful illustration of the way in which the Courts respond to applications where deferring revenue costs are arguably the primary driver for the application. The case follows previous decisions such as Stein v Sybmore Holdings Pty Ltd  NSWSC 1004 in NSW and Re Plator Nominees Pty Ltd  VSC 284 in Victoria, each of which are discussed below. In each State, the Court has statutory power to vary trust instruments in particular circumstances. In the Northern Territory, this power can be exercised where the Court “thinks fit”. In Western Australia and Queensland, the power can be exercised where the Court considers the variation “expedient” or where the transaction is in “the best interests of the beneficiaries”. In all other jurisdictions, the “expedient” test applies. In circumstances where a trust has been established with a vesting period of less than 80 years, the trustee may vary the trust deed, in accordance with an express power of variation in the trust instrument, to extend the vesting day. The decision of FCT v Clark  FCAFC 5 provides comfort that in many circumstances, such a variation will not trigger a resettlement of the trust for tax purposes. However where the trust instrument does not provide the trustee with adequate powers to extend the vesting day, an application to the Court may be necessary. The Court would therefore need to consider whether the trustee’s reasons for wanting to extend the vesting day are “expedient” or “in the best interests of the beneficiaries”, depending on the jurisdiction. Stein v Sybmore Holdings Pty Ltd involved an application under s 81 of the Trustee Act 1925 (NSW) to extend the vesting day of a trust established in 1978, which was to vest in 2007. The trustee sought an order authorising it to extend the vesting date of the trust, notwithstanding that the variation power in the trust instrument was insufficient to allow such an amendment. 2. the trustee anticipated that capital gains tax of $690,000 and stamp duty of $620,000 would be payable on vesting of the trust, diluting an asset pool valued at approximately $13m. The Court granted the order requested as it considered the amendment to be “expedient”. The judgment focused primarily on the first reason for the application outlined above, however the dilution to the value of the trust that would have been caused by the capital gains tax and stamp duty costs outlined above were a relevant factor. A similar sentiment can be found in the Victorian case of Plator Nominees Pty Ltd. The case involved a trust established in 1972 which had a 40 year vesting period. Consequently the trust was due to vest in 2012. The trustee brought an application under s 63A of the Trustee Act 1958 (Vic) that the vesting day be extended to the date 21 years after the death of the last living relative of one of the primary beneficiaries. 4. if the trust vested in 2012 a “significant capital gain” would be realised. The Court granted the extension and noted that, consistent with previous judicial authority, the fact that deferral of taxation costs was one of the drivers for requesting the extension did not preclude it from granting the extension. Re Arthur Brady Family Trust; Re Trekmore Trading Trust arguably further clarifies the position set out in the previous cases. In that case, the first trust was established in 1977 with a vesting date of 2017. The second trust was established in 2008 with near identical terms to the first trust (presumably as part of a trust ‘cloning’ arrangement), including the 2017 vesting date. 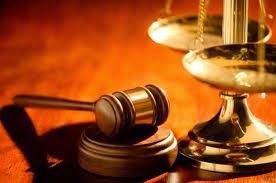 The applicants sought an order for an extension to the vesting date under the Trusts Act 1973 (Qld). The sole reason for the application outlined in the judgment was the applicant’s desire to defer capital gains tax and stamp duty costs which would substantially dilute the overall pool of assets to the detriment of the beneficiaries. The total tax and stamp duty costs across both trusts were anticipated to exceed $1.8m out of an asset pool of $15m. The applicant submitted that, in order to maintain the property portfolios, the beneficiaries would need to borrow funds to meet the transaction costs. Each of the contingent beneficiaries supported the application. After a detailed analysis, the Court granted the requested extensions as it was satisfied the “very substantial impact of taxes and duties upon the trust funds” and the unanimous approval of the beneficiaries supported the exercise of its discretion. A few key lessons can be taken from the cases above. First, many trust deeds from all eras, and particularly those established in the 1970s and 1980s include vesting periods significantly shorter than 80 years. Practitioners should be alert to this issue and ensure they methodically check the vesting day of every trust as part of any trust dealing. Secondly, Re Arthur Brady Family Trust; Re Trekmore Trading Trust provides authority that the Court may grant an order for the extension of a vesting day even where the sole purpose of the extension is to defer the capital gains tax costs and stamp duty costs that would otherwise arise as a result of the vesting, provided it can be shown that those costs would have a material adverse impact on the beneficiaries. Finally, although any application to Court carries a degree of risk, recent cases indicate the Court will generally react positively to applications for the extension of vesting dates, where there are compelling commercial or family reasons to order the extension. Following the successful launch earlier this year of the View Legal Directors Duties and Estate Planning apps, we have now developed and launched another Apple and Android app. Business succession is the important process of ensuring a plan is in place for a person’s business assets so they are dealt with, after death, as intended, while minimising the impact of challenges against the arrangements and costs such as stamp duty, tax and administration expenses. The business succession area is however heavily regulated and it is vital that business owners and their advisers have a deep understanding across all relevant areas. 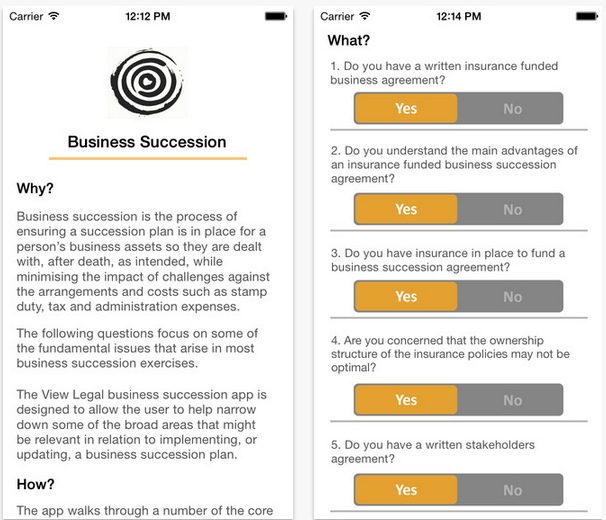 The business succession app is designed to allow the user to narrow down some of the broad areas that might be relevant in relation to a business succession plan.